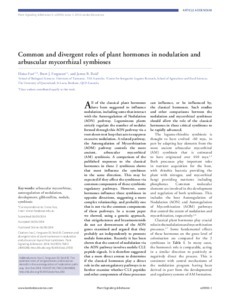 All of the classical plant hormones have been suggested to influence nodulation, including some that interact with the Autoregulation of Nodulation (AON) pathway. Leguminous plants strictly regulate the number of nodules formed through this AON pathway via a root-shoot-root loop that acts to suppress excessive nodulation. A related pathway, the Autoregulation of Mycorrhization (AOM) pathway controls the more ancient, arbuscular mycorrhizal (AM) symbiosis. A comparison of the published responses to the classical hormones in these 2 symbioses shows that most influence the symbioses in the same direction. This may be expected if they affect the symbioses via common components of these symbiotic regulatory pathways. However, some hormones influence these symbioses in opposite directions, suggesting a more complex relationship, and probably one that is not via the common components of these pathways. In a recent paper we showed, using a genetic approach, that strigolactones and brassinosteroids do not act downstream of the AON genes examined and argued that they probably act independently to promote nodule formation. Recently it has been shown that the control of nodulation via the AON pathway involves mobile CLE peptide signals. It is therefore suggested that a more direct avenue to determine if the classical hormones play a direct role in the autoregulatory pathways is to further examine whether CLE peptides and other components of these processes can influence, or be influenced by, the classical hormones. Such studies and other comparisons between the nodulation and mycorrhizal symbioses should allow the role of the classical hormones in these critical symbioses to be rapidly advanced.